Quiet Tuesday lunch time. Traditional pub interior, family run tenant business from Fullers. London Pride was therefore very good. Also on hand pump was ESB, Lacons Encore and two beers from Dark Star (owned by Fuller's) namely Hophead and American Pale Ale. Menu with several options and at very reasonable prices. Chicken and chorizo pie, mash, peas and onion gravy for £8 is not half bad, hot and tasty too. Staff were friendly and pub is well worth a visit. beers as well as the premium key keg stuff, but there are usually two guest ales on draft at any time. Well worth a visit! A good honest boozer based in South Street which hasn't changed for years apart from some new/secondhand furniture. 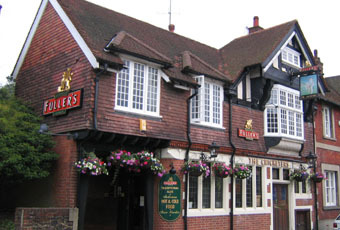 Usual selection of Fullers ales which was in good condition. The L shaped lounge has a variety of seating, from armchairs. high chairs to dining type chairs but was reasonably comfortable. There are at least three Fullers pubs on the main street through Dorking but this is the best. Very traditional with (surprise, surprise) a cricket theme. A few nice beers, free sandwiches if you're lucky, but beware the steep steps to the back garden!